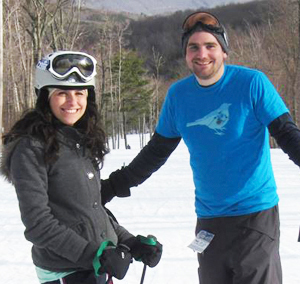 Downhill Threads are for skiers who want to wear their passion for the sport year round. If you have been lucky enough to experience what it feels like to glide down a slope, with light powder spraying up behind you, in the serenity of the mountains, then you understand the indescribable love every skier shares. Skiing is more than a pastime or a sport... it's a way of life. Unfortunately, this love gets lost in the graphics of most big ski corporations. They tend to just sell their own image and focus on their company logo. We want to put the focus back on skiing and the beauty of the mountains. That is why we created Downhill Threads! We started in 2012 with a few t-shirts, and are continuing to expand our catalog. Our goal is to have a full line of ski products that are focused on the sport itself, and not the company behind it. The creator of DHT is also the designer of every shirt and poster we sell. Tom Moyer has a passion for skiing and also for design. This brand was the perfect place to combine the two. Tom studied graphic design and illustration at Nazareth College in snowy Rochester, NY. He has spent the last 8 years designing shirts and other products for various clients and websites. His favorite mountain? Anywhere with fresh powder. If you like to ski, or like mountains, or snow, or tshirts, then you’ll want to LIKE us on Facebook and follow us on Twitter. We also offer special promotions, contests and announce other brand updates. Click the links below and say Hello!